I just recently wrapped up several weeks of fieldwork in Malaysia’s Tioman Island. 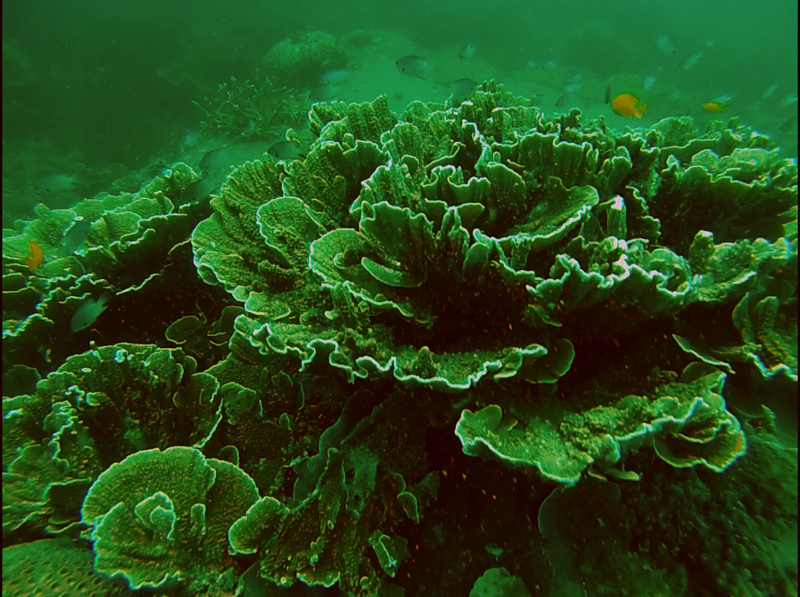 Tioman is a major dive tourism destination located in a government designated Marine Park some 20 years old. With dozens of reefs to dive, I had two major components to my field work: take representative ecological surveys of some of the most popular dive sites and then administer surveys and socio-economic based interviews to stakeholders in the hand full of villages that fringe the island. Given the wave of new and cheap photography options for underwater imagining, I adapted my ecological survey methods from English et. al 1997’s timed swim technique involving a fish census and hard cover examination at predetermined time intervals. I did this with a GoPro, and instead of a fish survey, as my research team was limited to one, I looked at an indicator far easier for a single diver with camera in hand to assess: percent living cover of hard corals in 1x1m quadrats. A major criticism of interdisciplinary research that looks at human-environment interactions is that either the human (socio-economic) or environment (ecological) indicators are ignored in the process of inquiry. My first round of studies conducted in Bali last summer relied on coarse grained UNEP assessments of reef health in two Balinese communities. This time around, I am using my own assessments based on percentage hard cover. Living hard coral cover is a valuable indicator as it 1) provides a visual motive for divers to come and contribute to the local economy and 2) a critical function in the ecosystem. My surveys of stakeholders ranged from local dive masters, boat operators, tank boys, dive shop owners, marine parks officers, ferry boatsmen, and so on. I asked people questions about how their community looks after their reefs all the while knowing the reefs are a critical piece of the local economy. Ultimately, I will have looked at 8 cases across SE Asia by the conclusion of my fieldwork, and will be able to make claims about specific community attributes that tend to also accompany healthy reefs. This entry was posted in Coral Reefs and tagged Adaptive co-management, coral reefs, coral triangle, ecosystem science and policy, fieldwork, Malaysia, MIT, Southeast Asia, Tioman Island. Bookmark the permalink.